Donald Trump is expected to push the international community to embrace Washington’s hardline approach towards Tehran during a rare address at the UN Security Council – but the open-ended agenda leaves room for surprises. 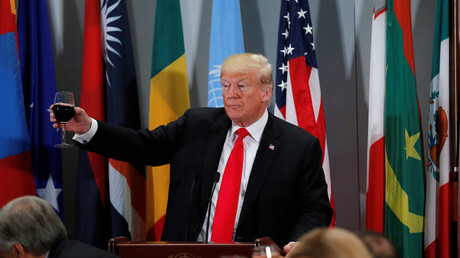 The US president will chair a meeting of the 15-member council, which focuses on global security issues, a day after speaking before the United Nations General Assembly, where he accused Iran of spreading “chaos, death and destruction” throughout the Middle East. The United States this month holds the presidency of the Security Council, giving Trump unfettered access to the esteemed international body – and another chance to rail against Iran. Usually the chair speaks last at council meetings, but the US leader, apparently not a believer in saving the best for last, has chosen to be the first to speak before the chamber. His remarks will be followed by addresses from French President Emmanuel Macron and British Prime Minister Theresa May. Trump’s address will mark only the third time in history that a US president has chaired a Security Council meeting – but it’s likely the first time that a former reality television star has held the gavel. Trump tweeted last week that he would “chair the United Nations Security Council meeting on Iran,” but the agenda circulated to Security Council members does not single out Iran or any other country. “The purpose of this meeting is to discuss ways the Security Council can better enforce the resolutions it has adopted… to counter the spread and use of the world’s most dangerous weapons,” it reads. Trump may use the opportunity to drum up support for US sanctions imposed on Tehran after Washington unilaterally withdrew from the 2015 nuclear deal. The accord’s remaining signatories are currently developing a payment system that would allow trade and business ventures with Iran to continue. Four of the five remaining signatories to the deal – Britain, China, France and Russia – are permanent members of the Security Council. However, the expanded scope of the meeting has led to speculation that Trump may also touch upon alleged chemical weapon attacks in Syria. The United States has been warning for weeks that it would hold Damascus responsible for any chemical attacks carried out in Idlib province, the last stronghold of Al-Qaeda-affiliated jihadists in Syria, and that such an attack would prompt a military response. Media reports have mused that North Korea and the Salisbury poisoning saga could also be agenda items. Whatever topics are brought up, it’s unclear how much Trump will be able to achieve as guest chair. Commentators have argued that his performance is unlikely to result in anything concrete. US envoy to the UN Nikki Haley has stated that there are currently no plans to adopt a resolution at Wednesday’s meeting. Trump’s General Assembly speech made headlines – and inspired viral videos – after the diplomat-filled audience was heard laughing at the US president’s boast-filled address. But should we expect the same kind of bravado and theatrics during the Security Council meeting? Not everyone is expecting fireworks, however. “I don’t think we will see any major intrigue in what he will say,” Russia’s UN Ambassador Vassily Nebenzia told Reuters.